Have you ever taken a road trip across country or backpacked through Europe? Besides a sense of adventure, one of the most important ingredients in a successful trip is being smart about what you bring with you. You don’t want to overpack and drag along unnecessary items that will get in your way and be burdensome (a coffee maker, for instance). You also don’t want to forget those items that are necessary and that will fill your travels with ease and a sense of comfort (think: your favorite fuzzy blanket). Not too much. Not too little. As Goldilocks knew, pack enough to ensure your conditions will be just right. As the seasons change and New England winter fast approaches, it’s important to pack well for this year’s lengthy trip to Hibernationville. There are some bright spots there—sunshine reflecting off fresh snow and cozy winter evenings with friends or curled up with mulled cider and a movie. But for the most part, Hibernationville is a place that’s cold and dark. Even for those who love winter and its many joys, expansive and high-energy movement can feel awkward and the pace of life inside and out slows down. For those of us who find winter long and taxing, this is especially true. In preparation, you want to bring the right gear to match these distinct conditions so that you’re as comfortable and healthy as possible, fully energized to meet spring when it finally arrives. While it’s easy to identify the physical pieces of equipment that support these conditions of hibernation, we often forget about the emotional component. We don’t prepare for what we’ll be emotionally bedding down with. And unless we address this important travel consideration now, habits that have us feeling worried, disheveled, overwhelmed, frustrated, and otherwise triggered will remain steady companions. Hibernationville is filled with a lot of quiet time for introspection, so befriending what we bring along on our trip is important. I don’t know about you, but I don’t want to spend a lot of cold cave time hunkering down with the residual pain from a lost love. Reconciling and releasing as much as possible of this now will free up a lot of emotional space over the coming months. What unresolved conflicts or challenges are still poking at you and creating tension? What thought patterns have you doubting yourself or distancing you from ease? Conversely, what inspirations and sources of happiness do you have in your life that would be nourishing to maintain such as friendships, activities, and self-care routines? How can I create more ease and smiles for myself? 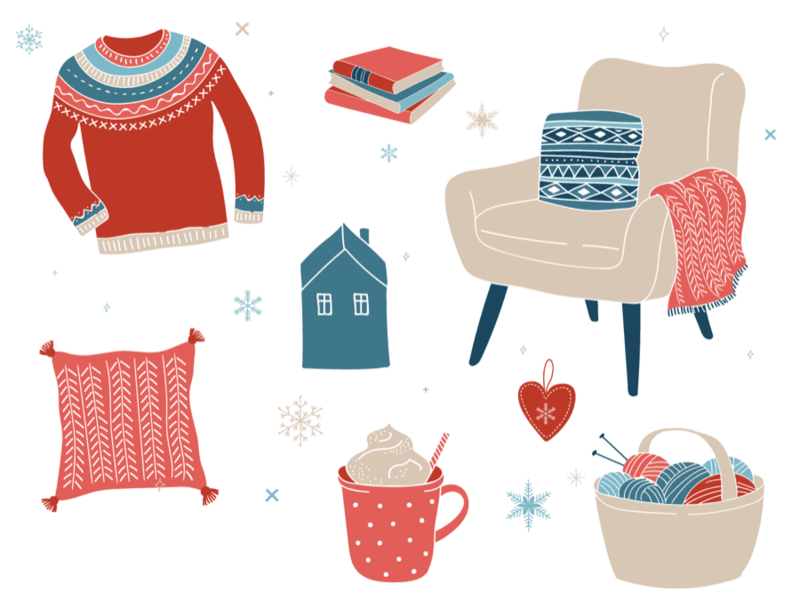 How can this time of year be filled with cozy, hygge-like comforts and nourishing norms? What need is not being met that could really make a difference in how I experience these next few months? Can you start to invigorate patience as a daily practice, knowing that impatience feeds your need to control and interrupts important connection in relationships? What personal boundaries might you begin to establish with others so that you daily just-for-me space is available for fun and creative projects that really feed your soul? Is there a chance to have that reconciling conversation with Uncle Harry before he comes over for a holiday celebration? With holiday activities, do you tend to overburden yourself out of guilt or tradition, afraid to change it up and say, No, not this year? Would unplugging from electronics one day a week provide a source of refuge? Now is the time to be discerning about what you’ll be packing, being kind in the letting go of things that are too heavy. Wish them well and focus on the lightness, giving yourself the time and opportunity to smartly expend your energy on that which directly supports your personal care, heart warmth, and ease. As we know, New England winters are tough, so let’s move beyond mere survival and into revitalizing rest. 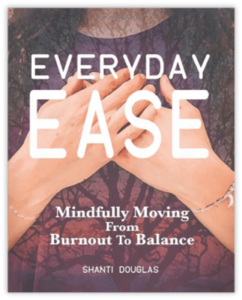 For more information and support for living every day with greater ease and balance, regardless of the season, check out Shanti’s new book, Everyday Ease: Mindfully Moving from Burnout to Balance. It’s available at Gibson’s Bookstore in Concord or online at Amazon.